The Contera™ Bullet outdoor-ready megapixel camera features 1080p and 5-megapixel (MP) resolution for optimum performance. The Contera Bullet combines a day/night mechanical IR cut filter with an integrated motorized 2.7–12mm varifocal remote focus and zoom precision iris (P-iris) lens. For clear color images in low-light, NightView™ offers strong low-light sensitivity for capturing details in extremely poor-lit scenes, and is further enhanced by built-in Smart IR LED illumination that automatically adjusts output in response to the distance of an object in view to prevent over-exposure when the object is very close to the camera. The SD card slot supports up to 256GB of storage capacity for convenient onboard storage. 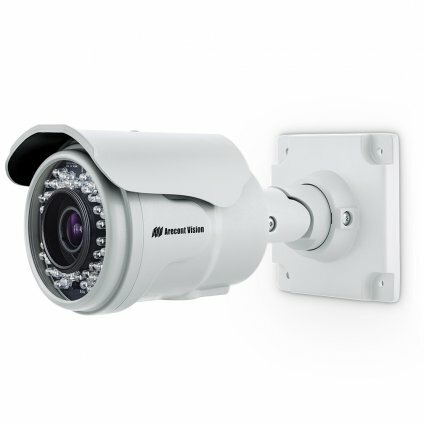 The camera’s power can be supplied via a Power-over-Ethernet (PoE - IEEE 802.3af) compliant network cable connection. The Contera Bullet is IP66 rated for both indoor and outdoor applications. All models feature an impact resistant cast-aluminum housing capable of withstanding the equivalent of 55 kg (120 lbs) of force.